Aretha Franklin's family have said that they found the closing eulogy at her funeral offensive and distasteful. The Rev. Jasper Williams Jr. said black America was losing "its soul" and described children raised without a father as "abortion after birth". 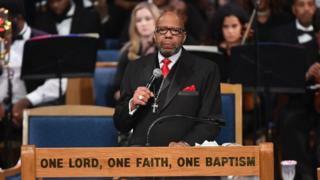 "He spoke for 50 minutes and at no time did he properly eulogise her," said Vaughn Franklin, the singer's nephew, speaking on behalf of the family. He added that his aunt did not choose the pastor to speak at her funeral. 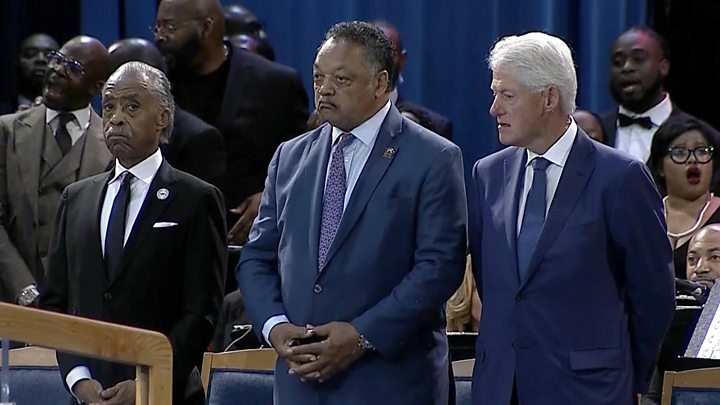 Instead, the family selected Williams because he had spoken at other family memorials, including the funeral of Franklin's father, the minister and civil rights activist CL Franklin. "We feel that Rev. Jasper Williams, Jr. used this platform to push his negative agenda, which as a family, we do not agree with," the family said. The pastor's fiery, old-school sermon received a mixed response in the church on Friday. Some of the congregation could be heard whispering: "Talk about Aretha!" but others gave the speech a standing ovation. Many felt his comments about single parent families were offensive, especially as Franklin raised four children by herself. Others were incensed by his assertion that: "Black lives must not matter until black people start respecting black lives and stop killing ourselves." Image caption Aretha Franklin died last month of pancreatic cancer. She was 76. Stevie Wonder, who played immediately after Rev. Williams' eulogy, seemed to address those comments, saying: "We need to make love great again because black lives do matter. Because all lives do matter." The pastor has not backed down from anything he said at the funeral, and said he respects the family's opinion. Responding to criticism of his eulogy at the weekend, he said some of his comments had been misunderstood. "I'm sure much of the negativity is due to the fact that they don't understand what I'm talking about," he said. "Anybody who thinks black America is all right as we are now is crazy. We're not all right. It's a lot of change that needs to occur. This change must come from within us. "It is ludicrous for the church not to be involved. The church is the only viable institution we have in the African-American community. We must step up and turn our race around." Vaughn Franklin said the speech had "caught the entire family off guard," as they had not discussed the content of the eulogy in advance. "It has been very, very distasteful," he said. It was unfortunate, he added, because all the other speakers and performers had been respectful.